The jihadis who melted away as French forces moved into northern Mali first got a foothold there by joining a separatist rebellion of the nomadic Tuareg people. Many Tuareg, including those who did not support the revolt, now live in fear of reprisals. Once upon a time two brothers went hunting together far out in the Malian bush. They wandered further and further, but found no game, until eventually they collapsed exhausted under a tree. The younger brother began to complain about how hungry he was, so the elder one went off to try to find food. At last he came back with some meat which was eagerly cooked over a fire. Only when the younger brother had satisfied his hunger did he start to wonder where the meat came from, and then he noticed a bloody bandage around the other's leg. Horrified, he realised his elder brother had cut off a piece of his own thigh to save him from starvation, and he was overcome with guilt. That is the story told in Mali to explain the origin of a unique relationship between two of the country's peoples, the Bozo and the Dogon, supposedly the descendants of those two brothers. They are bound forever to help one another in any way they can - but never to intermarry. That way relations are always kept pleasant, as between friends, whereas marriage, and family ties, can result in horrible complications, as happened between the two hunters. The ties between the Bozo, traditionally fishermen along the River Niger, and the Dogon, hunters and farmers on a high plateau to the south, are just one example of what has been called "cousinage" - special bonds between ethnic groups or traditional castes. So the Dogon are also cousins of the Songhai, farmers and traders in the east of Mali, while the Fulani, the herders who wander the endless yellow grasslands dotted with glossy green mango and shea butter trees, are cousins with families of hereditary blacksmiths of any group. Cousinage, part of the generally harmonious relations between the peoples of Mali, is based on mutual benefit, and respect for one another's territory. 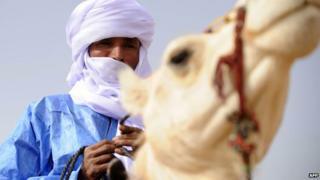 Herders need traders to buy goods and sell their cattle. Everyone needs blacksmiths. But there is a particular people in Mali, they say, who have no cousins - the light-skinned nomads of the north, the Tuareg. You can find some Tuareg scattered throughout Mali. There are Tuareg MPs and Tuareg ministers. But Tuareg separatists fought the government throughout the early 1990s and began another rebellion a year or so ago - the rebellion, later hi-jacked by jihadis of many nationalities, that sparked the present crisis. For many in the West, the Tuareg are irresistibly romantic - mysterious men of the dunes and the camel-trains, their heads swathed in traditional blue turbans and the less traditional designer sunglasses. But politics in Mali are about fighting, unromantically, for scarce resources. And while the Tuareg have suffered terribly from repeated drought, the country's other peoples have suffered too - and many feel, rightly or wrongly, that more is spent on the Tuareg because they make more political fuss. Today, as the rebellion is crushed by French-led forces, the Tuareg are in trouble. Whether or not they supported the revolt - and many did not - they are afraid now of reprisals. So afraid that in parts of Mali they have completely disappeared - fled to neighbouring countries, or gone into hiding. Down on the bustling banks of the Niger in the port of Mopti - the Venice of Mali as the faded tourist posters call it - I find stacks of square white slabs flecked with grey. Marble, I assume. But it is salt - carried by camel to Timbuktu from the mines in the deep Sahara, then by dug-out canoe to Mopti. Tuareg traditionally control the salt trade. But there are no Tuareg with the salt today, only Bella - the black Africans who were historically the Tuareg's slaves. This is no time to be a white Malian, they say when I ask where the Tuareg have gone. Their pale skin's enough to get them arrested or even killed. Just a few minutes drive away hundreds of young men are running whooping and singing through the bush. They are the Ganda Izo, the Children of the Land, a militia composed largely of black refugees from the north that is training now to go home - and help the Malian army root out those who collaborated with the rebels. We are the ones who know who's who, they say - who looted, who stole, who ordered or administered Islamic punishments for smoking and drinking - and who raped. Many say they saw rebels carry girls off into the dunes and return with them only days later. Mali's government - and militia leaders - say there will be no vengeance now in Timbuktu or other northern towns, only justice - and no settling of ethnic scores. The authorities may make real efforts to avoid that. But individual militiamen talk of revenge - and a Malian military instructor helping to train them says the Tuareg, all Tuareg, are enemies of the state. This is a bad time in Mali to be a people without cousins.